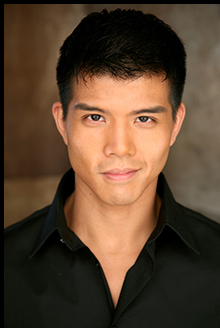 Broadway star Telly Leung is a "triple threat" - a theater term for someone who can act, sing, and dance. With a host of top-Broadway shows under his belt, including his current role in the hit Broadway musical - Aladdin, as well as television appearances including the role of Wes the Warbler on Glee, he is someone who continues to prove his mettle. Telly Leung takes time from his busy schedule to speak with Luxury Experience. A native New Yorker, you grew up in Brooklyn, New York, and like many	teenagers, you discovered the joy of acting in high school plays at New	York's Stuyvesant High School, a math and sciences school. However, unlike most high school students, while still in school, you	were able to parlay that into a professional career, beginning with working	on The WB-Team 11 doing live and television performances. Where did you learn to sing and dance? I started taking singing lessons for fun after school. I would save	up my money and take dance lessons, or buy play tickets at TKTS (discount	tickets in New York City), or buy "rush" tickets. I was lucky to be a New	Yorker where Broadway was only a subway ride away. You further honed your acting craft at Carnegie Mellon University's	School of Drama. Your theatre credentials are impressive: Flower Drum Song, Pacific Overtures, Thoroughly Modern Millie, Wicked, Rent, Godspell, Allegiance, The	Secret Garden, and In Transit,	leading to your current role of Aladdin. For readers who have never acted on stage, would you please describe what the	attraction is for actors and what it is like to appear nightly before a live	audience? There is nothing like it, to connect and to have an experience that	will change us; it is a spiritual experience, like religion or school, where	people gather together in a room, which only happens once in that space,	whether it is in a theatre, in a classroom, or by a sermon. I do 8 shows a week and it feels different every night. Growing up, who inspired or motivated you to select a career in	acting? I grew up in a traditional Chinese home, my parents were immigrants,	my mother was a seamstress and my father worked as a manager in a restaurant,	so they were not "stage parents." I had wonderful teachers in high school - the chorus teacher and the	acting teacher who volunteered his time after school to put on the shows; I	give credit to those amazing public-school teachers for all the work they do. Actor, singer, dancer, and songwriter, with several recorded albums,	what is next for Telly Leung? I play lots of cabarets and Jazz clubs to connect with audiences	through music, and have performed in San Francisco to London and Tokyo. I hope	I will be doing more next year. When not acting on Broadway in the title role of Aladdin, or performing in concert, how do you like to spend your	free time, what little there is of it? I married my partner (James Babcock) of 13 years last year, and he's	a "9-5" person, and I'm a show person, but we're big fans of the theatre and	like to go to concerts when we can, and sometimes we just sit on the couch	and relax. Telly, thank you for taking time to speak with Luxury Experience. I look forward to seeing you in Aladdin on Broadway. For information on Telly Leung and upcoming performances, please visit his website: www.TellyLeung.com. © December 2017. Luxury Experience. www.LuxuryExperience.com. All rights reserved.